Tastefully appointed villa home offering 3 bedrooms, 2 bathrooms, 2 car garage, private pool. 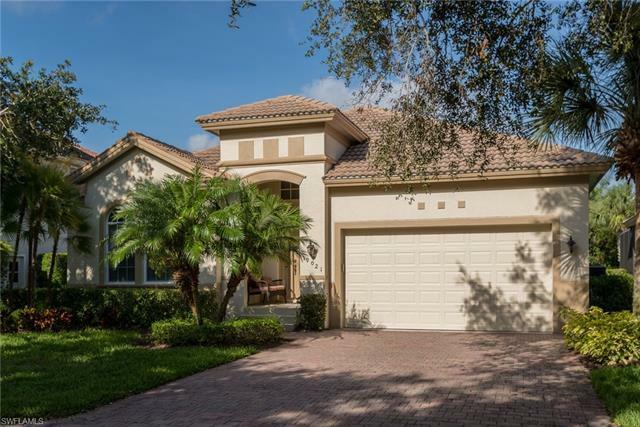 This spacious open floor plan offers an open kitchen with granite counter tops, marble back-splash, cove molding, large floor tile custom designed and , stainless steel appliances. The Master bedroom has beautiful coved ceililngs, and private bath with dual sinks and separate over sized shower. The Private River Park has a canoe/kayak, boat launch and Gulf access just a block away. Turtle Cove has a community pool and exercise facility. West Bay Club is a gated golf and tennis community west of Rt 41 that offers superb amenities- Bay House- pool and restaurant, Beach House- Inside/outside seating bar/restaurant on the Gulf of Mexico, Tennis, River Park and Natural Preserves.Golf private equity club programs are available.